The Western Mindanao State University (WMSU) Peace Mediators Club has been officially accredited by the UNESCO National Commission of the Philippines (NatCom). 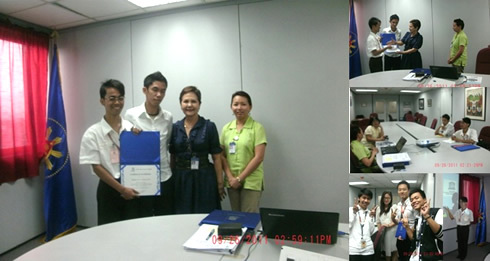 Mr. Johnny Piscos and Mr. Manuelito Siason, president and vice-president of the club, respectively, were in Manila on September 26 for the UNESCO orientation and the awarding of Certificate of Accreditation which was held at the office of the UNESCO NatCom, Department of Foreign Affairs, Pasay City. Only three universities nationwide, from among the many that applied for accreditation this year, were accredited. These are University of Santo Tomas, Colegio de San Agustin and WMSU. Accredited UNESCO clubs are expected to build sustainable bridges within civil society, seek to disseminate UNESCO ideals and undertake activities directly inspired by those of the organization, broaden cultural horizons and provide an invaluable service to the UNESCO NatCom in supplementing public information activities. UNESCO Clubs in the Philippines are a global grassroots movement that supports UNESCO’s priorities by using the community’s own experiences, skills and outlook to foster peace and exchange. they consist of groups of people from all ages, from all walks of life and every background who share a firm belief in UNESCO’s ideals as set forth in its constitution. The WMSU Peace Mediators Club aims to provide students of the university projects and activities that will further enhance their awareness and knowledge on domestic and international issues concerning peace, education, science and culture. In addition, the club, which has currently over thirty members, will serve as a medium for bringing peace and bridging the gap between various cultural and religious groups of students in the university. Finally, it aims to promote WMSU as a peace zone university.